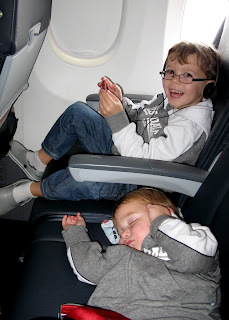 To say we were apprehensive about our first flight with our three young children would be an understand. Our sons are typical boys, full of energy and mischief. In preparation we spoke to them often about what it would be like to fly and what noises they might hear etc. The night before our scheduled flight we opted to stay at the Holiday Inn near Sydney airport to ensure the kids could stick to their normal bedtime routine and not have to be woken early to travel the 2 hours to Sydney in the wee hours of the morning. This worked out great. After a full night sleep, we had a quick breakfast before heading to the airport. Our day started afresh. While J checked in our backpack, I amused the boys by walking around looking at the sights, but we quickly became a sight ourselves. Many a person stopped to wish me luck or tell me I was crazy or braver then they. I was loaded up I guess, Phoenix in his kelty child carrier on my back and Morgan and Hamish holding a hand each. I'm sure some thought I was traveling alone with the trio. We breezed through customs without any problems, settled in the departure area long enough for the kids to burn off any last minute energy at the McDonald's playground, then boarded our flight. Phoenix was alseep before we took off. Both Morgan and Hamish scored a window seat so had a great time experiencing their first take off. The smiles on their faces was priceless. They both dived into the oversized snack bag I bought along. After munching on a quarter of the supplies in the first 10 minutes they settled down into flight mode. Morgan fell asleep on my lap. Awesome, 2 out of 3 asleep. At this point we thought it timely to surprise Hamish with his new 'holiday' toy. An apple iTouch. He was over the moon and sat quietly playing games and watched a new movie on his new best friend. This allowed mum and dad some very unexpected rest time for which I was very grateful. Once Morgan woke we gave him his iTouch and he took no time at all to master the games section. Kids these days are techno wizards I tell you. The remainder of the flight went by so fast. The 6 hour flight truly felt like 3. About an hour out from landing, I changed the children into some cooler clothing, feed them some sandwiches and fruit and made them use the bathroom. All these things were in the hope that I could quell any whinging of 'Im hot, I'm hungry or I need to go to the toilet' while we were transiting through the Denpasar airport. Again this preparation worked well. The process was fast and easy. We were on our way to our villa before we knew it. Here's hoping that our next flight is just as enjoyable for all. Holiday is over - but the travel has just begun.